The only constant is change…we need to manage the climate and we need to manage our [stock] numbers. I’m a third-generation farmer living on the family farm with my wife, Clare, and 3 kids. We graze sheep and cattle, with continually fluctuating numbers based on available feed. Ravenswood is 1000 hectares. At times we also lease other grazing country to increase our turnover. 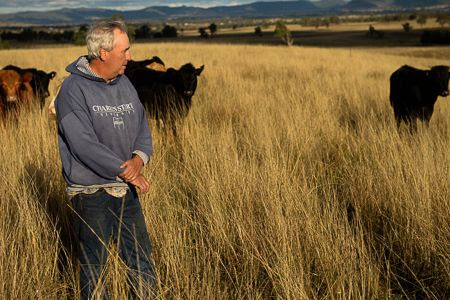 Livestock grazing is the traditional enterprise in the Rylstone district, which is typical tablelands terrain. Our property ranges from 600 to 900 metres above sea level. The region usually has about 650 mm of rainfall spread pretty evenly throughout the year. We have a high incidence of frost – between 30 and 60 frosts a year – which severely retards any winter growth. Summers are often hot and dry, making spring and autumn our main times for pasture growth. 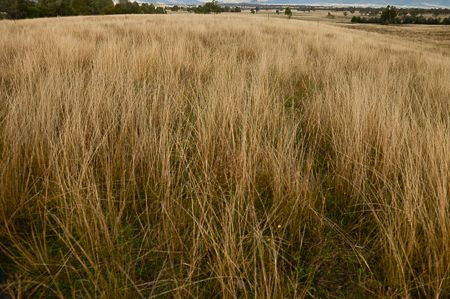 Although rainfall is evenly distributed across the year, seasonal variation in temperatures, frost days and all other factors that influence pasture growth are huge, and every year is different. There is no ‘average season’. My view is if you run a set number of animals, you’re either understocked or overstocked all the time – there’ll never be one day in your life you’re exactly right. You’ve either got a surplus of feed or a deficit. So we keep the numbers changing according to available pasture growth. Our goal is to match our stocking rate, which is the number of animals we have on hand, to our carrying capacity, which is the amount of grass we’ve grown. That provides the flexibility we need within our system. We use the matching of stocking rate to carrying capacity to manage drought by selling down livestock numbers as available feed reduces. We have no facility to feed animals in drought – we don’t make any hay or feed any grain, so the season dictates the number of animals. We really have only two immutable rules. One is to never drought-feed, and the other is that we will never have animals that we can’t sell; we may have breeders, but we have no core stock that can’t be sold. And that allows us that flexibility that we need. These rules are based on climate variability and our assessment of the seasonal outlook. I try to keep a close handle on the amount of stockfeed available and make decisions early, as leaving destocking to a time when everyone else is doing the same is usually untidy. Often by going early you actually open up restocking opportunities at the other end. I suppose it’s a case of trying to be in a position to sell when many are buying and buy when many are selling. We try to make stocking rate decisions on a 3-6-month timeframe based on the amount of grass we actually have at the time and also what we are likely to grow in the next season. I still use long-range forecasts to a point, but in recent years they have proven to be unreliable. My attitude now is to look at them more as a tool rather than as something I can depend on. El Niño and La Niña are useful tools, as is the Indian Ocean dipole, but I think they can only be taken as a guide to potential rainfall for our district, as there are usually other influences affecting what actually occurs. ‘The only constant is change’ is a favourite saying of mine, and certainly we’re always prepared to look at new options for what we do. I think learning from past experience is really critical. We’ve continued to change over time, and I think we always will. A lot of that is to do with our assessment of the climate variability. Here at Ravenswood, the effect of the 1994 drought on people, animals and the land made me certain we needed to make a change in the way we operated. It was a watershed year for me. We really started refining things from there, moving away from breeding, getting a lot more flexibility in the system and into trading. In trading, animals can more quickly be bought and sold than with traditional breeders. The main difference between us and a Wall St stock trader, of course, is that we do the value-adding here, by ensuring our land can give the stock what they need to improve in condition and weight. There’ve been drought times over the past four or five years where we’ve been down to very few stock, and obviously if the seasons improve, we build up numbers very rapidly and try and take advantage of the grass that is growing and turn that into profit. Environmentally, destocking before a drought hits has been a big winner. We don’t want to run down ground cover and deplete soil reserves by having animals overgrazing plants and walking around in dust bowls, so we get them off early. There’s always a cost associated with growing grass, of course. You have to make sure the technology used and the other inputs are more than compensated for in the extra production. We have to know if extra production from inputs is actually profitable, or if we are just growing more grass and spending more money. With improved commodity prices, there is probably an opportunity to economically increase production with fertiliser and other inputs. But this needs to be balanced with other environmental factors, such as ground cover and soil pH, to name a couple. One of the best analogies I’ve heard of for managing an agricultural system is the ‘3-legged stool’. One leg is the environment and climate, one leg is the social aspect, and the other leg is the economic aspect. All of them are equally important. If you remove any one of them, the stool will topple over. The social aspect includes not just the people working on the farm, but also the local and global communities. What you do socially is really important: you’ve got to be happy doing it, and you have to produce a product that is safe to use and one that the global community is happy to accept. The economic aspect speaks for itself. If your business is not financially and economically viable, failure is assured. And the environment and climate leg? Climate is probably the biggest influence on our production here. We realise that there’s always going to be variability, so we base our system around it; it means we can accommodate the changes in climate. If you are continually depleting the environment by stretching the system you’re working with, it’s going to fall over eventually. To me, agriculture needs to place equal importance on these 3 aspects. And to me, it’s a great way to look at your agricultural system. Sam on his property, ‘Ravenswood’, in the Central Tablelands of New South Wales. Because he trades stock, Sam often has a variety of breeds on Ravenswood at any one time. 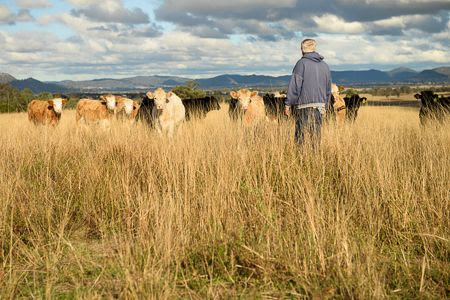 Sam herds his mob, changing paddocks regularly. Sam will move animals off pasture early, rather than overgraze. 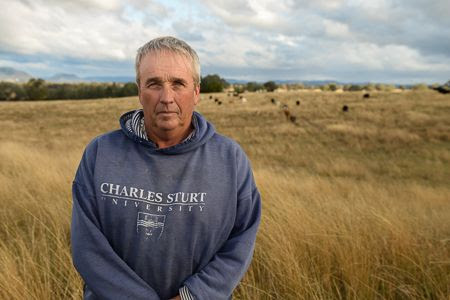 For Sam, climate is the driver behind all of his management decisions.